Arises from the ABplpapppa cell. 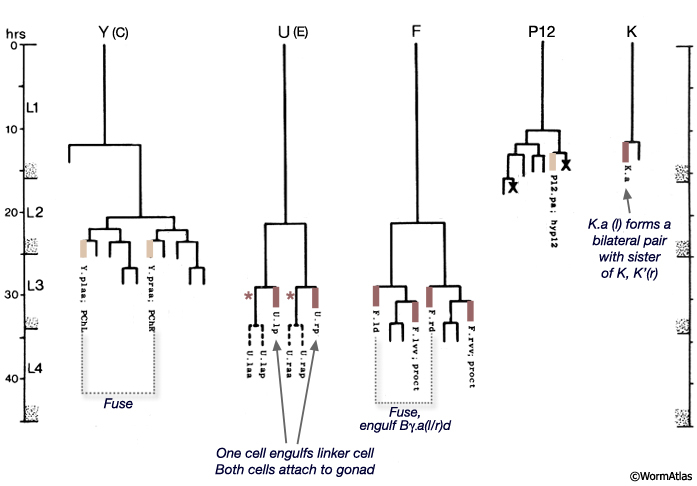 K is a blast cell that divides during late L1. K.a becomes a rectal epithelial cell and K.p becomes the DVB neuron. In males, the K cell is involved with proctodeum development where the ventral anterior portion of the cloaca forms an extensive region of contact with the gonad and this connection is formed by the daughter of K (K.a). Amphid neurons with single ciliated endings that project into ring via commissure from ventral ganglion and make diverse synaptic connections in ring neuropil. Also take up FITC. Evolutionary survival strategy that relates to the selection of traits for the best survival in a specific environment. K-selection (as opposed to r-selection) is associated with stable environments which are density dependent. K-selection species are typically large, have a long life span, produce few offspring and have a lengthy developmental time period during which there is high investment of parental care. Most individuals are expected to live near the maximum life span. An abnormal cytoplast produced during early blast cells divisions if nuclear cleavage fails (Leidel and Gonczy, 2003). Resultant cell divisions occur in which nuclei do not assort properly to each daughter cell, so that some gain little or no nuclear material (karyomeres) and other blastomeres gain duplicate nuclear material. A cell that acts to directly “murder” a neighboring cell (Sulston and White, 1980; White et al., 1991). No such activity has yet been proven to occur in C. elegans. An experimental procedure which measures the effectiveness of an agent in causing death of whole animals; for instance, live healthy C. elegans may be placed onto a treated substrate and observed periodically by light microscopy to assay the death rate or survivorship (Tan, et al., 1999; Mylonakis et al., 2002). Animals failing to move in response to prodding with a platinum wire are considered dead. Any movement or action that is evoked in response to a stimulus; thus an increase in body motion in response to a chemical signal is a chemokinesis (which can be positive or negative). A kinesis does not necessarily orient the animal to the source of the stimulus, but only alters the animal’s rate of action. Orthokinesis involves a change in speed of (forward) locomotion in response to the stimulus, whereas, klinokinesis involves a change in the rate of turning or reversal in response to the stimulus. The regular motions of C. elegans on a culture plate may be a complex mixture of these mechanisms (Dusenbery, 1980a and 1980b). A protein complex which associates with the centromere of a chromosome to bind the chromosome to the mitotic spindle. The kinetochore plays an active role in associating with microtubules, and perhaps also in driving assembly or disassembly of the mitotic spindle. There are two regions of the kinetochore, an inner region which is associated with centromere DNA and an outer region which interacts with microtubules. C. elegans is a holocentric organism, so that instead of having a single localized centromeric region on the chromosome (monocentric), it assembles diffuse kinetochores along the entire poleward face of each sister chromatid, which facilitates a high rate of chromosomal rearrangements and translocations (Coghlan, 2005; Oegema and Hyman, 2006). The motile form of cilium known for many other animals, which typically display 9 + 2 arrangements of microtubules, a distinctive basal body, and sometimes a rootlet beneath the cilium. Sensory cilia in nematodes, including C. elegans, are distinctly different from kineocilia, lacking a conventional basal body and most often having 9 + 0 microtubules. A severe local bending of the body, more abrupt than the normal smooth body bends of C. elegans. Kinker phenotype A mutant phenotype in which the animal moves in very severe bending motions, more sharply angled and/or much deeper than normal sinusoidal body bends of the wild type. Usually associated with an Unc (uncoordinated) phenotype. A model for vesicle fusion where synaptic vesicles fuse transiently with the plasma membrane to release their contents, but rather than collapsing into the synaptic membrane, they remain intact and are recycled for refilling and further transmitter release.